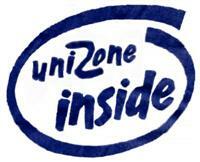 Unizone is a BeShare client based on Ozone 1.1.0 build 87 made by VitViper, and Muscle, written by Jeremy Friesner. More translations in every Preview (File Transfer Window and away / here messages in Preview 3). You can find the most current version from beshare.tycomsystems.com using your favourite muscle client. Code from Unizone has also been used in development of Ozone 1.1.1 and Image Splitter 1.0.0.